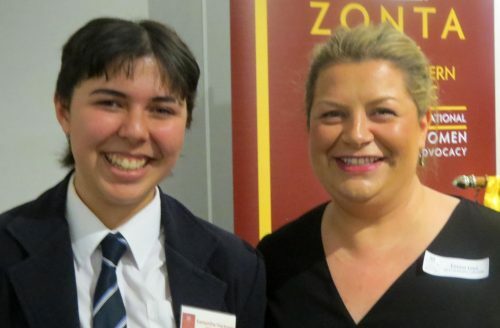 Perth College Year 12 student Samantha Hackman has won the 2018 ZONTA Club of Perth Northern Suburbs' $1,000 Young Women in Public Affairs Award. A cheque and certificate were presented at a dinner at Ambrose Estate Wembley on 5 September. "ZONTA's mission of empowering women worldwide through service and advocacy, is something we strongly believe in. Our firm, likewise, strives to empower all our team members to achieve their full potential. We encourage the pursuit of excellence, and regularly contribute towards prizes and awards to recognise individual achievements. We feel this particular Award is really worthwhile in encouraging our women leaders of the future." said partner Emma Leys. Since that time 888 awards have been given to 756 young women representing 56 countries. These young women will be tomorrow's policy-makers and world leaders. On the world stage she is a member of the United Nations' Youth West Australia and has been selected to represent this State in Adelaide. Samantha believes that women should look out for each other. She added, "Women are bombarded by social media with societal expectations. Women need to lead by example and not worry about 'fitting in' or 'how they look'. Our priority should be integrity of character and what one stands for".